TSPSC Latest vacancies recruitment 2018. Online applications for this TSPSC Extension Officers jobs will be accepted from 23-12-2017 to 24-01-2018. TSPSC Extension Officers Jobs recruitment exam will be held in the month of March 2018. Online applications will be accepted through TSPSC official website of www.tspsc.gov.in/. Candidates must have qualified Degree in Social work or Degree in Home Science. Selection for these TSPSC Extension Officers jobs will be held through written exam only. More information related to this TSPSC Extension Officer recruitment exam pattern, age limits, pay scale and other details are given below. 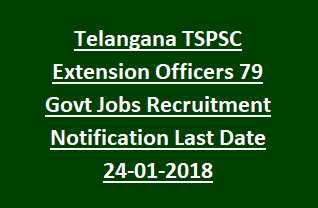 There are total 79 Extension officers jobs in this TSPSC Recruitment 2018. Age limits are 18-44 years as on 01-07-2017. For SC/ST/BC candidates 5 years and for Ex Serviceman 3 years of age relaxation is given. or B.Sc Food Science Nutrition/Food Technology & Management/Nutrition, Zoology Botany, Chemistry & Bio Chemistry. Pay Scale for EO jobs is 24,440- 71,510/- (R.P.S-2015). Candidates selection will be held through written exam only. Written exam will consist of 2 papers. Interested candidates can submit their application form online on or before 24-01-2018. Only online application are accepted for this Telangana PSC Extension Officers vacancies notification.